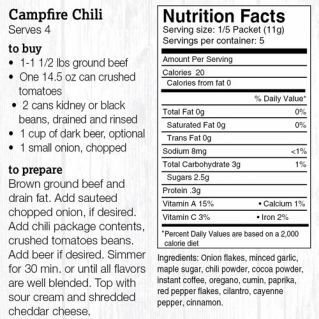 Spice up your dinner tonight! 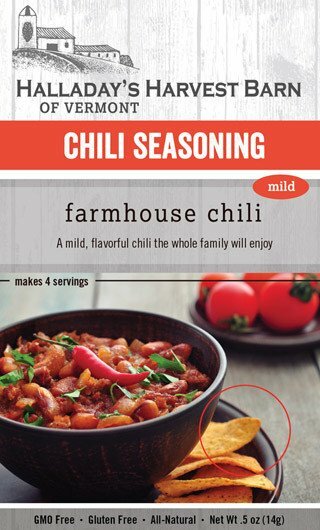 Halladay's Farmhouse Chili will be the base you need to create your family's new favorite dinner. Made in Vermont. Spice up your dinner tonight! 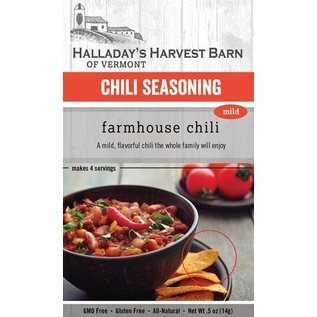 Halladay's Farmhouse Chili will be the base you need to create your family's new favorite dinner. With a hint of maple sugar, coffee and rich chili flavor our seasoning is the perfect start for a quick and delicious meal. "In the 1990's, Rick & Kathleen developed a few herb blends in the kitchen to supplement the slower months at the family's greenhouse and florist. Halladay's debut was at a small fair in Brattleboro, Vermont, in the pouring rain. Harvest Barn's phenomenal success grew one small fair at a time with the help of dedicated customers returning each year. All of Halladay's products begin in the kitchen, not in the lab. New ideas come from staff members, customers, and midnight inspirations." "Halladay's products are created for busy families! Just add a few fresh ingredients to our delicious blends and create memorable meals and party items."